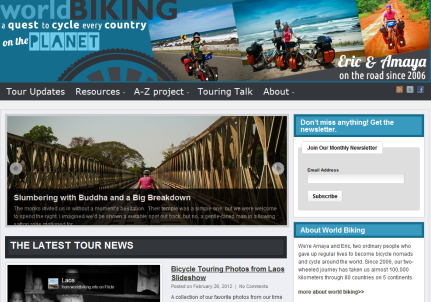 Blogs worth Browsing: A bike Journey–London to Melbourne – Go Bicycle Touring! Some bike journeys are just fun to follow. Guy and Frederike set off from London in May 2010 and are busy cycling their way to Australia. 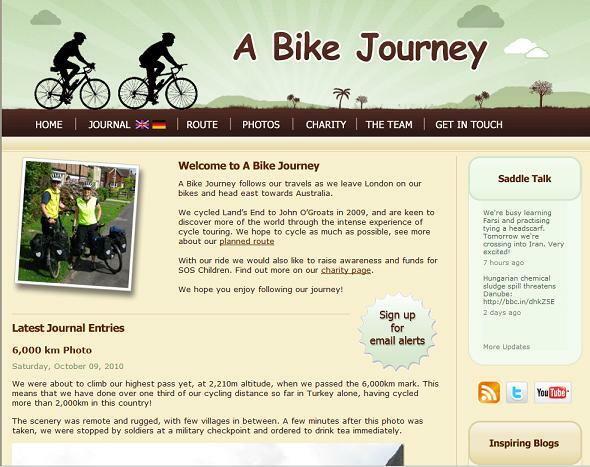 Their site, A Bike Journey, documents their tour with amazing photos, videos and descriptive and detailed travel tales. A lot of care has gone into designing the website and it’s easy to delve right into the tour. On the homepage you can begin reading the latest news from the trip, plus view a gallery of the latest photos and see Guy and Frederike´s newest videos. The scenery here is quite remote, and apart from the main road there are not many paved roads at all. Often, the road snakes through deep river valleys, which mountains towering left and right. There are many signposts for remote mountain villages which can only be reached via tiny, steep dirt tracks, with some villages being over 50km away. Some of the tracks involve river crossings, and the villages must be completely cut off in the winter by snow. They must be almost self sufficient, and indeed we saw some villagers preparing for the winter by drying cow pats for fuel. Unfortunately, many of the villages we see are built from traditional mud bricks, which is disastrous in an area as prone to earthquakes as Turkey, as they easily collapse. So far, we had only been aware of Turkey being in an earthquake zone in theory, but this was soon to change. We were asleep in our hotel in Erzincan, where we took a rest day, when we woke up at 5am by our bed shaking and rattling. “Earthquake!” Freddie yelled, and we saw lights turn on in neighbouring buildings and heard doors slamming. The shaking quickly stopped, but we still decided to get out of the building to be sure. When we came downstairs, there were a few people milling around, but the staff just laughed at us and sent us straight back to bed. They must be used to earthquakes in this area, but for us it was quite a novelty, and pretty scary too. The earthquake recorded a 3.2 magnitude, so nothing major, but we did get a bit worried when we found out that Erzincan had been completely flattened by an earthquake in 1939. Over 32,000 people died and the whole town was rebuilt a little further north. So far the couple has biked through the UK, France, Germany, Austria, Slovakia, Hungary, Croatia, Serbia, Romania, Bulgaria, Greece and Turkey. There are still a lot of kilometers left before Guy and Frederike make it to Melbourne. Why not follow along as they ride through Asia? Check out A Bike Journey. I have heard about motorbike driving from one country to another…but this is really a wonderful effort…i must say.